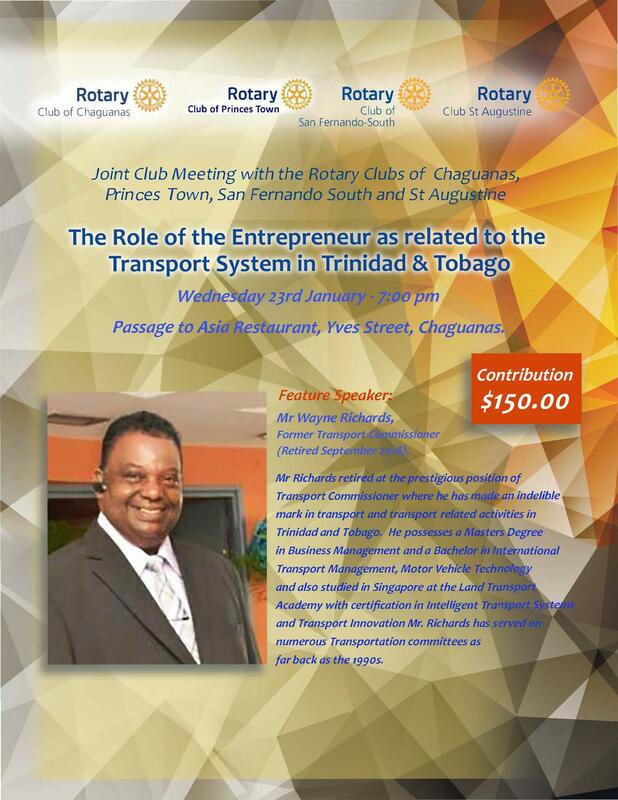 The Rotary Clubs of Chaguanas, Princes Town, San Fernando South and St Augustine will be having a joint meeting next Wednesday 23rd January from 7:00 pm. Venue: Passage to Asia Restaurant, Chaguanas. Mr Wayne Richards retired at the prestigious position of Transport Commissioner where he has made an indelible mark in transport and transport related activities in Trinidad and Tobago. He possesses a Masters Degree in Business Management and a Bachelor in International Transport Management, Motor Vehicle Technology and also studied in Singapore at the Land Transport Academy with certification in Intelligent Transport Systems and Transport Innovation Mr. Richards has served on numerous Transportation committees as far back as the 1990s.